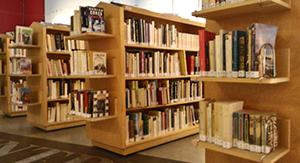 Le Centre culturel francophone de Vancouver offers a collection of nearly 6,000 books in French, one of the largest collections in British Columbia. From literature to social sciences and reference works (dictionaries, atlases, etc. ), as well as books for young readers, you will discover the pleasure of reading in French at Le Centre. You can borrow up to six books at a time, for up to three weeks. Almost one-third of the collection at Le Centre is composed of books for children and adolescents. A special area is reserved for children in our library. Are you looking for a specific item? Use our online database below or call us 604 736-9806. Le Centre also offers used books for sale at a fixed price of $1 per volume. Every member of Le Centre can loan books. Le Centre offers free Internet access to the community. Two computers are available as well as wireless access. Feel free to use this service!